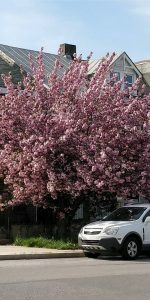 One of the things I love about the East Coast is all the beautiful flowering trees. I’m originally from Southern California and yes, we do have our beautiful Magnolia trees and Night blooming Jasmine bushes and there are still some Orange trees that blossom beautiful white little flowers that develop into oranges, but there is nothing like flowering trees here on the East Coast. Now, you’ll only see these beautiful trees with their flowers in the Springtime. Never in any other season. Unlike the flowering trees, you don’t have to wait for Spring to bloom. You can start right now to reach the full beauty that is inside of you to let it out, no matter what season it is. God has placed in your heart a certain beauty and gifts that no one else on the face of the Earth has. Just you. Develop it, let it out and let it shine for your own benefit and for the benefit of others. Be you. You are enough. “The dream you have in your heart was put there for a reason. It was sown into you as part of your life’s journey. It’s not a joke. It’s not some vision that you might have. It was put there because it’s possible. God put that dream into your heart, into your soul, into your mind because its part of your destiny and you should chase it with everything you’ve got. Remember this: Things don’t matter, people do. Chase that dream. It’s in your heart, it’s in your soul for a reason. It was wired there to give you strength, to give you purpose, to give you direction. Never give up on that dream. This entry was posted in Doing Your Part and tagged be yourself, you, your gifts.. Bookmark the permalink.